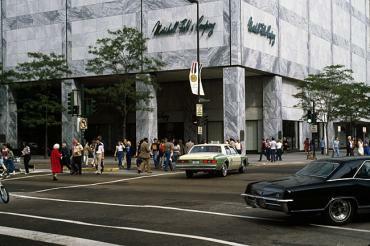 October 20, 1975 – Branches of Marshall Field and Company and Lord and Taylor open for business on the first eight levels of the new Water Tower Place, the 74-story skyscraper on North Michigan Avenue. Lines begin forming at 8 a.m. at the doors of the “vertical shopping center” [Chicago Tribune, October 21, 1975] and crowds inside both stores are so large employees have trouble getting to their posts. “We couldn’t be more pleased,” says Arthur E. Osborne, Vice-President and General Manager of the Marshall Field’s stores in the Chicago area. “We’re just as excited about this as anything we’ve ever done. There are wall-to-wall people …” Charles Siegmann, Vice-President and Regional Managing Director of Lord and Taylor, says, “I’m running out of superlatives. We knew it was going to be great, but never anything like this. I’ve never seen such great-looking people, the way they’re dressed and how friendly and gracious they are. This is probably the biggest thrill our company has ever had. And it’s just amazing the number of men who are here.” The complex is a joint development of Urban Investment and Development, a subsidiary of Aetna Life and Casualty Company, and Mafco, a subsidiary of Marshall Field and Company. Architect Edward D. Dart of Loebl, Scholssman, Bennett and Dart is the leading architect on the project. 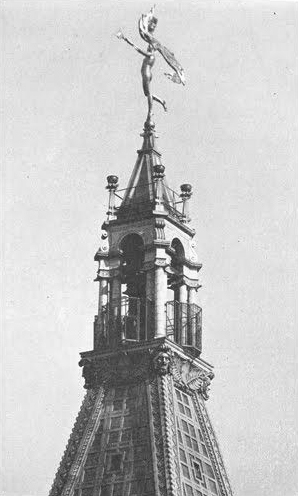 October 20, 1900 – Progress Lighting the Way for Commerce, a statue over 21 feet in height, is lowered into place atop of the Montgomery Ward headquarters at 6 North Michigan Avenue. It is not intended merely to sit atop the building; it will function as a weather vane that “obeys every change of the wind.” [Chicago Daily Tribune, October 21, 1900] Richard Schmidt, the architect who designed the building, oversees the placement of the statue. The figure is that of a young woman who holds a flaming torch in her right hand and a caduceus, or a short staff intertwined with two snakes, in her left. In Roman mythology Mercury, who was the messenger of the gods, and the protector of merchants, shepherds, gamblers, liars and thieves, is often seen carrying a caduceus in his left hand. Scottish-American sculptor John Massey Rhind was the artist who created the piece. The statue was taken down in 1947 and cut into nearly three-dozen pieces. Some of those pieces may still sit in parlors all over the city.